 The New Four Seasons Hotel Toronto Review | Luxury Toronto Wedding Planner | Devoted to You Inc.
Two weeks ago, a brand new Four Seasons Hotel opened its doors in Yorkville. A grand fountain sits at the front of the hotel. Behind it is going to be a roseless rose garden that is still under construction. Unlike some of the other five star hotels in downtown Toronto, there is no grand foyer when you enter the lobby. Instead, by design, the Four Seasons Hotel emanates a cubic feel. 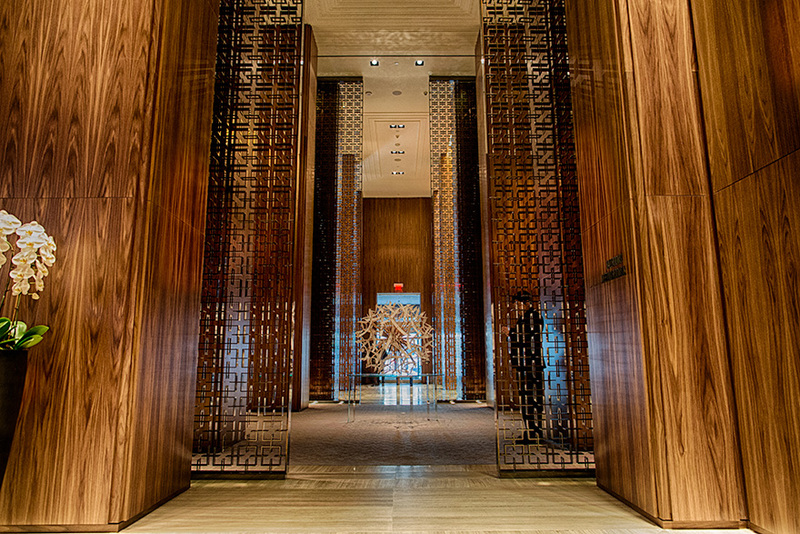 Different areas of the lobby are sectioned away by wooden walls or pillars, mixed with metallic screens to create a dimensional look similar to what you may find in New York City. A single dandelion centrepiece sits in the middle of the lobby, right in front of the the reception desk where additional dandelion motifs overhang above. 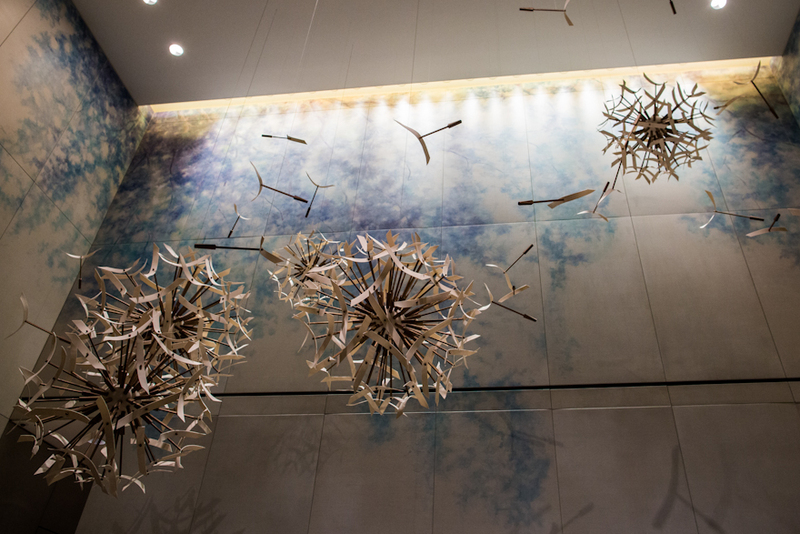 The architecture of designer Yabu Pushelberg can be felt throughout the lobby. There are two restaurants in the hotel and one situates on top of the other. dbar in the lobby is a restaurant and lounge, whereas Café Boulud offers a more casual and light menu. Both restaurants are the concoction of famed Michelin 3-star Chef Daniel Boulud. The events halls are located on two separate floors. 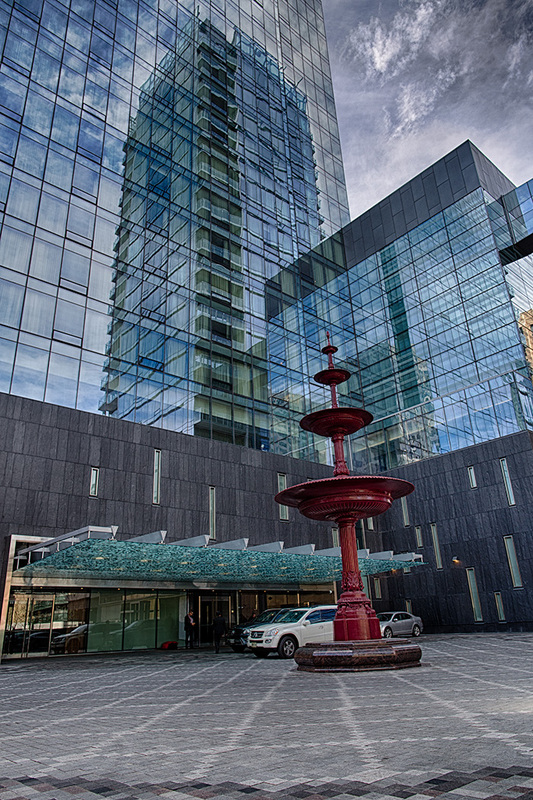 The Vinci hall and Laurentian rooms are located on the sixth floor, whereas the grand Aria hall is located on the third floor. It is worth noting that while the function areas have their own set of elevators, the Aria hall floor can also be accessed through guest room elevators. Booking a wedding at the Four Seasons Hotel also allows for the the bride and groom to receive a complimentary room. Unfortunately during our visit, the entire hotel was booked so we were not able to view any of the guest rooms. The photo above depicts what guests will see once they exit the elevators on the sixth floor. Off to the right is the entrance to the Vinci hall. The Vinci hall is bright, spacious, and the walls have hand painted florals on them. The ceiling lighting design is truly modern and the entire area gives off a very neutral and pleasant tone. The Vinci can hold 180 guests with a dance floor and 220 guests without. On the third floor we have the Four Seasons’ largest hall, the Aria. The pre-function area has a very similar theme to the lobby, however instead of metallic screens this floor is accented with mirrors. The Aria hall is truly magnificent, and would be an amazing place to host a wedding. Being able to hold a capacity of over 400 guests, the Aria hall exudes an elegance that can be found nowhere else in Toronto. The sides are decorated with stained glass-like wraparound cathedral windows. Crystal chandeliers overhang from the ceiling and the crystal drapes decorate the curtains. We can’t wait to plan a wedding here! Many thanks to Designing Trendz for allowing us to post photos of their decor in this room. If you are planning a stay, the Four Seasons Hotel also has a 30,000 square feet luxury spa on the ninth floor and a fitness gym on the eighth. For more information, please visit their website here or contact us. landing page photo by facibeni fotografia|ProPhoto Photography Website Design by Northfolk & Co.